A. M. Offenwanger has written a magical fantasy that is a delight to read. I know when a book is really good and that is when I can remember with clarity the characters and the story weeks later. This tells me that the characters were memorable, likable, and the story interesting. Offenwanger’s writing is memorable, delightful and magical. The story involves a former Librarian, Cat, who is not happy with her life and decides to do some traveling with the money she has saved. She has been “dumped” by her boyfriend and life seems to be going nowhere for her. A lover of museums, Cat visits a museum of antiquities and admires several beautiful and strange appearing turquoise bowls, that apparently have a magical quality about them. Little did Cat know that these bowls would change her life beyond anything she could imagine.The world building is simple, but effective. 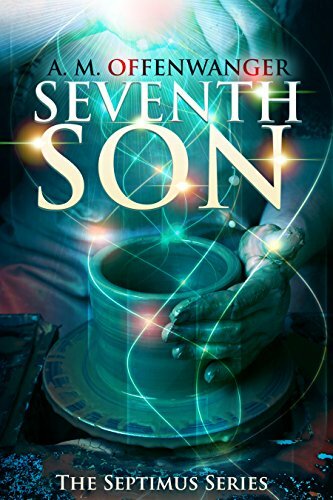 I highly recommend Seventh Son, as a delightful summer read. It is uplifting, with a love story that will make your heart melt. Previous Post Promote Your Writing! I think this book sounds lovely, Karen. Robbie, yes, it is a very lovely book and a delight to read. I enjoyed how each main character had an essence of goodness at their core that was revealed through their actions and personality. This sounds very good, Karen. I’m so glad you’re getting them! I’d love to know what you think. To date there are three novels and one short story (“Lavender’s Blue”), which comes between books 2 and 3. And Book 4 is in the works! Thank you so much for this lovely review! I’m so glad you liked Seventh Son. Now I’m inspired to keep working on Book 4 in the series!